Why Ponte Vedra Beach real estate? The area has top-ranked schools, no income tax, a. 6.5 percent sales tax, gorgeous beaches, beautiful neighborhoods, and welcoming people. That description is apt enough, but the homes for sale in Ponte Vedra Beach have something for everyone, with prices ranging in the $100,000 range for condos and on up from there. Oceanfront homes in Ponte Vedra Beach proper range from around $3,00,000 to $10,000,000, and the average home price in Ponte Vedra Beach is approximately $450,000. Ponte Vedra Beach sits between Jacksonville Beach to the north and St Augustine to the south. Unlike Jacksonville Beach, Neptune Beach and Atlantic Beach, there is less density. Ponte Vedra Beach has a decidedly suburban feel with clearly defined neighborhoods. There isn’t one architectural style, though in Old Ponte Vedra Beach you will definitely get a more coastal vibe, and you’ll see Mediterranean architecture in many areas. Some of the larger neighborhoods in Ponte Vedra Beach are Marsh Landing, TPC Sawgrass, and Sawgrass Country Club. As said, the area is known for it’s A rated schools. Ocean Palms Elementary and PVPV/Rawlings are the two elementary schools servicing the area. The middle school is Alice B. Landrum, and the high school is Ponte Vedra High School. 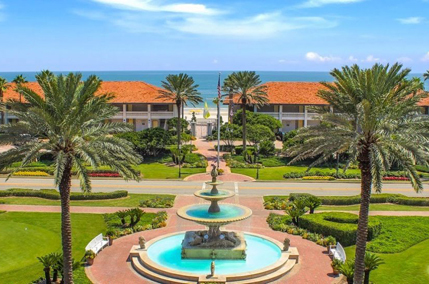 The Ponte Vedra Inn and Club, the Lodge and Club, and the Cabana Club are all beachfront clubs, and there are public beach accesses all along Ponte Vedra Boulevard, though the best parking is at Mickler Beach access. Rarely will you meet a transplant who hasn’t fallen in love with it.